Bodyguard alerts when a movement in sight of the camera is detected. Place the iPhone or iPad so that the camera has a good view on the area that has to be tracked. A soon as something moves an alarm will be triggered. Of course it does not only detect movements in the field of view, there are other events that cause an alert. After running the app, the camera will detect any motion in it's view. Any move in that area will set off an Alarm. Besides, it would be waste of the app to use it to just protect your nap, even if it does that perfectly. Use Bodyguard to guard your nap, to clean your desk in time, to correct your tie or to get rid off what nobody else should see. And if you recently purchased a new iPhone, you can run this app on your old iPhone, having it guard an area where you can't be yourself. You can even use it as baby phone or to protect a remote room in your home. 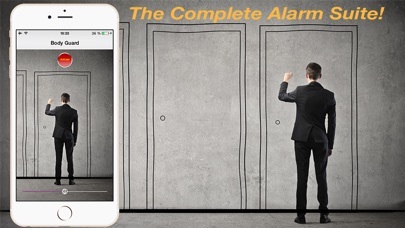 A simple way to use your iPhone, iPad or iPodTouch to watch a defined area and to alert you when something, anything is happening there. Bodfyguard WILL detect it and and alert you realiably. Drop a line if you terribly miss a feature or if you experienced an unexpected bug. We love to talk to our customers!